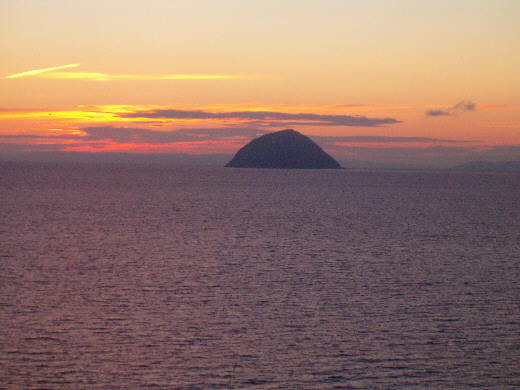 This is a photograph of Ailsa Craig at sunset. Ailsa is a truly unique island even by Scottish standards. It is 1,114 feet high, about 2.5 miles (4 kms) around the base and is made of a unique very hard granite. The stone's properties made it much sought after for the production of curling stones. Historically, the island was owned by the Crossraguel monks who were gifted the island by King Robert the Third. The island also plays host to a castle but to be honest, it is more a �Keep� than anything grand and palace like and probably held fewer than eight persons.